What follows is not a review, or even a proper critical evaluation of Never Hike Alone: A Friday the 13th Fan Film. Instead, I'll try to peel back the storytelling mechanics to explain why this unofficial entry in the franchise hits all the right notes. It would be the worst kind of hyperbole to discuss the “world” of Friday the 13th in the same vein as larger, more respectable franchises such Star Wars, Star Trek, or 007 James Bond. The Friday the 13th films are situational in the same sense as episodic television comedies. With obvious allowances (an undying monster antagonist, telekinetic teenagers, body-swapping demons, etc. ), the series is grounded in “our” reality, not futuristic locales or exaggerated ports of international espionage. That said, the perspective from which a Friday is told is very specific: the campfire legend. The audience rebels whenever an entry deviates from this point of view. Paramount and New Line/Warners have had their difficulties walking this straight-and-narrow path for the last twenty years. They seem to believe that a new variation on the theme−a gimmick−would propel the series to a new popular height when the opposite is true. Friday the 13th has been described derisibly as junk food cinema. In truth, it’s probably closer to simple rustic home cooking. 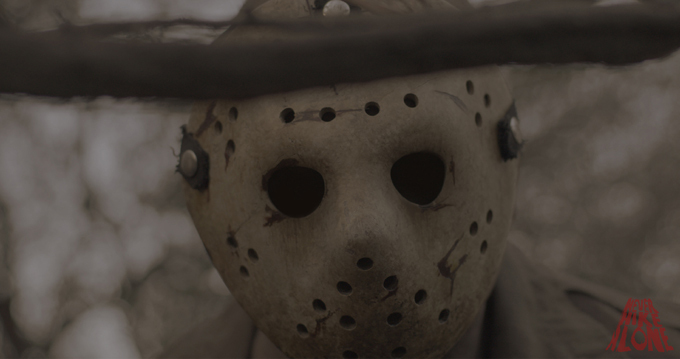 Never Hike Alone: A Friday the 13th Fan Film returns the franchise−unofficially of course−to its roots. That the film can comfortably be placed at any point in the series’ chronology (at least until its final moments) is a testament to its intentions: this is a celebration of the franchise in the form of a template. Vincente DiSanti has crafted an unmistakable return to form for Jason Voorhees. Along the way, he also managed to introduce the series to modern sensibilities. By stripping down the story to its essence, DiSanti evokes the through-line narrative structure of Blumhouse productions: sleek, direct, and free of baggage. The artificial ingredients once considered necessary to “the Friday formula” are eliminated without any damage to the experience. There’s no need to dream up an explanation for a group of college kids to shack up in the woods. Here, a hiker named Kyle stumbles across the remains of Camp Crystal Lake by chance. The audience is not asked to suspend disbelief at this turn of events because there is nothing to question. “Found footage” is usually a term used to describe a modern take on cinema verite, an often handheld, raw documentary-style film technique that acknowledges the camera as part of the narrative. Fans were divided when an official sequel was in development that used the technique, but it’s difficult to imagine similar complaints about Never Hike Alone. Only perhaps a tenth of the running time is told “first person”, but here it’s an important ingredient in the storytelling. Whereas earlier chapters in the Friday saga were told from the Final Girl’s point of view (Alice’s artistic perceptions of events/Ginny’s psychological view etc. ), the “found footage” conceit explicitly recognizes the audience as the point-of-view reference. How completely fitting for a “fan film”. When Kyle speaks to his streaming video audience, he’s communicating directly to the viewer of Never Hike Alone, who watch the film from a video stream. This is not “breaking the fourth wall”, it’s tearing down all four. Never Hike Alone’s status as a “fan film” gives it some freedom that a proper sequel wouldn’t have. The lake is clearly not the same lake the audience saw in earlier films. The cabins are different. Any of these details would be jarring in a legitimately produced chapter, but not here. The audience understands the medium and adjusts expectations accordingly. Surprisingly, though, rather than lowering the standard, this freedom to reinterpret the setting gives the film a distinctly unpredictable atmosphere. Hollywood productions are often over-produced to the point of sterility. Never Hike Alone feels fresh and untethered to focus groups, pre-release screenings, or corporate notes. The ”fan film” status also untangles the legal hurdles necessary to facilitate a truly inspired cameo appearance. Thom Mathews’ return is unlikely in an official installment, but here character rights are not a concern. DiSanti cleverly plays with the audience. At first, the viewer isn’t sure if Thom is playing the same character he portrayed in Jason Lives. His initial reaction to the escalating situation inside the ambulance (“We should follow protocol and call it in…”) suggests that this may be a different character. His name badge gives the viewer pause. In the final moments, when Tommy Jarvis−yes, THAT Tommy Jarvis− calls out his iconic line, “Remember me, Maggot-head?”, we are treated to one of the biggest moments in the franchise’s history. Tommy Jarvis and Jason Voorhees on screen together again. Fan service? Absolutely, but then, this IS a fan film. Maybe the current rights holders should purchase Never Hike Alone and canonize the film. After all, Vincente DiSanti’s film does more than celebrate a long-running fan-favorite franchise, it enriches it. On the other hand… perhaps the outlaw nature of the fan film might suit the movie better. After all, the best urban legends and campfire tales are all told from unclear sources with hazy motivations.